A liquid cleaner that removes dirt, scale, rust, body oils and cosmetic residue accumulated in reusable spa filter cartridges. Regular cleaning of spa filter cartridge will prolong the life of the spa filter cartridge. 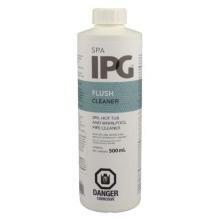 A liquid cleaner used to remove scale and calcium accumulation in the pipelines of spas, hot tubs and whirlpools. Compatible with all types of sanitizers. A liquid spa cover cleaner that removes grime accumulation and stains while creating a protective film that restores lustre and brightness of the cover. Specifically formulated for the cleaning of vinyl spa covers. Has a very pleasant smell that will not offend bathers. WARNING: Prior to using COVER CLEAN always test an isolated area of the surface to be cleaned to ensure compatibility. 2. Prepare cover surface by cleaning heavy dirt and grime with water and a soft cloth. 3. Use COVER CLEAN on small areas at a time while wiping dry with a clean, dry cloth. 4. Apply on a regular basis to protect and enhance the spa cover life. Regular cleaning of the spa cover will protect and enhance the spa cover life. WARNING: Prior to using any cleaning product, always test an isolated area of the surface to be cleaned to ensure compatibility. 1. Spray TUB CLEAN on a damp cloth or sponge. 2. Apply on surface to clean. 3. Allow to stand a few minutes and wipe off. For hard stains, allow TUB CLEAN to stand longer. 4. Polish with soft cloth.